The experiment room theme is my favorite. 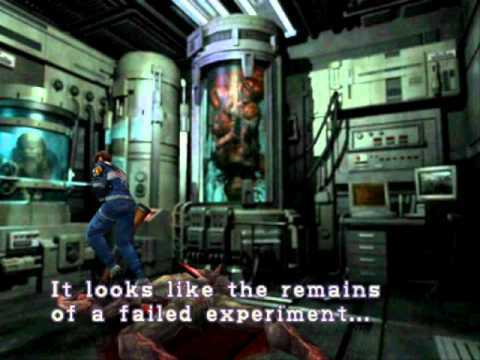 It's the room in the lab that's only accessible in the B scenarios and I think the only theme that carried over from the originally cancelled RE2 (aka RE1.5). It's so creepy. It's where you have to use both fingerprints. There are 3 super lickers in there and an extra magazine for the SMG. That place you wish you were. While the old soundtrack is awesome in the new RE2 it can distract you from hearing the Tyrant’s steps. I played through Leon A with the old soundtrack on, but turned it off for other play throughs. Well there's a mod that plays the DMX song with he shows up and you can't hear shite. Decided to look up how I get the USB for my second run through. I don't know how I didn't catch it before. The autists have now fully determined hwo the dynamic difficulty system works. Hunk/Tofu modes are locked in at 7. You have a hidden score that goes up or down depending on how you're doing and that's what triggers when you enter or recede into a new difficulty level. so is the 2nd run a condensed playthrough from the other perspective, an equivalent run to the opposite characters A, or something else entirely? tried looking it up, but couldnt find a concise answer and didnt want to risk spoilers. just finished Leon A, so i need to do Claire 2nd run for the true ending? Leon A was badass. the Mr X backlash is pretty unfounded, imo. hes basically just flushing you out the station anyway, and was only a problem cause i didnt clear out the library. that was a crazy, stressful, sweaty palmed nightmare. my only issue is i think the lab parts are missing something. maybe the naked zombies, or another creepy area. dont know, just felt like it coulda been scarier. still cool tho. That's the sense I got for the little bit of my Claire 2nd run. But I decided to stop and do Claire's full first run before either 2nd run. Ghost Survivors free DLC comes out Friday. Adds mini-stories centered around three minor characters that died and gives the player control of them in "what-if" scenarios. Doing my S+ run on Claire A. Made it to sewers and saved in chess room at 59:56. You guys and your no save / limited save runs. I'm more than happy to have my C grade. I am old, so I do remember playing many a game that had limited or no saves back in the day. I don't miss that era at all. Same here. I have zero problems playing the game on assisted mode and saving as much as I can. Too bad they didn't port this one to PSVR. I got an A with Leon last night. It was assisted though since I'm just trying to get the knife. Beat it the 1st time on standard. I saved so much ammo and made so many MAG rounds that the last fight was stupid easy. Had so much left over too.